The general offers and terms shown are valid on the day of consultation. Although these are periodically updates, any confirmed bookings shall be honoured on the date of stay, at the specified terms. Any order is guaranteed by the credit card that is normally not charged at the moment of booking. It shall be charged only in certain specific cases. This information is specified on the booking confirmation document. If in doubt, please refer to this document. The overnight stay contract is concluded either verbally or in writing (by e-mail, fax or letter). The room booked is at the guest’s disposal as from 1:30 p.m. on the day of arrival and it must be vacated by 11 a.m. on the day of departure. 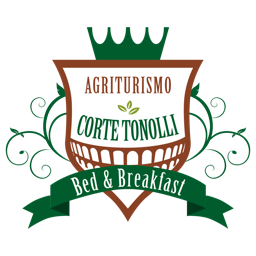 The Corte Tonolli B&B Holiday Farm considers the booking valid until 7:30 p.m. of the day of arrival. In case of arrival after this time, it is possible to call the reception. In case Corte Tonolli is not informed of late arrival, it may assign the room to another guest so as to avoid the loss of the room booking. Acceptable credit cards include VISA, Euro/MasterCard, Maestro and CartaSì. The entire price of the stay must be paid directly upon the holiday farm premises. The credit card shall be immediately charged should the booking be a special offer, with immediate pre-payment (for example, these are offers that cannot be either modified or cancelled). In these cases, the sum charged as a guarantee corresponds to the total cost of the stay. Also in the event of a booking, the cost of which shall be charged at the moment of booking, certain tax, services or extra costs must be paid in full on the holiday farm premises. The amount charged at the moment of booking includes only the services that can be paid at the moment of booking (certain options can be booked, but they must be paid in full only on the holiday farm premises) and the tourist tax must always be paid in full upon the holiday farm premises. The service can be paid in advance by credit card or bank transfer. Upon the holiday farm premises, the payment can also be made either in cash or by cash card. The invoice must be paid in full upon departure at the latest. In the event of the payment of a deposit or a part payment, the booking becomes firm and definite only upon reception of the abovementioned payment on behalf of the owner. The balance payment of the booking must be paid directly upon the hotel premises. Modifications to the booking are allowed (change of the date of stay, of the names, of the number of people, of the type or number of rooms, etc. ), subject to the hotel availability no later than four days from the expected day of arrival. As regards any changes to be made, please contact the hotel via e-mail at the following address: info@cortetonolli.it or by telephone at the following number: +39 045 794 5477 from 8:00 a.m. to 1 p.m.
• In case of a booking in which the credit card has not been charged. As regards the booking cancellation, please contact the hotel via e-mail at the following address: info@cortetonolli.it or by phone at the following number: +39 045 794 5477 from 8:00 a.m. to 1:00 p.m.
• In case of a booking in which the credit card has been charged. The procedure to follow is exactly the same; however, in any case, please send an e-mail to: info@cortetonolli.it (even if the cancellation has been made by phone), so that the competent department can, if necessary, arrange for the relevant refund to be made. • Outside booking centre opening hours. Please cancel the booking by sending an e-mail to the specified address. In case of a dispute relating to the date of cancellation, it is the written proof that we will find, that can be supplied and that shall prevail (proof of having sent an e-mail for example, with the indication of the date and time). The cancellation is not subject to a fee should it have been made before 12:00 (midday) within three days prior to the day of arrival. As regards any cancellations made following this time, a fee equivalent to the price of the first night shall be invoiced. In case of no-show, or rather should a client not arrive at the hotel on the expected day of arrival without having given prior notice to the hotel owner, our no-show terms shall be applied, or rather: invoicing of 100% of the first night of the stay that should have been benefitted from. Should the client not show up (no show), or leave before the end of the stay, the hotel reserves the right to retain the deposit in case this has been sent in advance. In case of late cancellation (after the cancellation deadline without fee payment) or no-show, the owner shall have the possibility to charge the credit card supplied as a guarantee of the booking. An invoice can be issued, upon request. Should the hotel facilities be unable to charge the credit card, the client shall be contacted so that he can provide the details of another credit card or be able to provide payment by cheque. In case of force majeure, the hotel shall have the faculty not to take into account the relative time limits required for booking changing and cancellation without the payment of fees. It may be decided upon not to apply penalties. In this case, it has the right to ask the client evidence to explain the relevant case of force majeure. I do hereby acknowledge to have been informed of these General Conditions of Sale prior to the sending of the booking. Therefore, the booking entails the total compliance on my behalf to the General Conditions of Sale as well as the acceptance without any reservation the relative provisions in their entirety. No penalty shall be applied in case there is the possibility to re-sell the room as the original booking. In this case, the deposit paid shall be considered valid for a future booking. The delayed occupation of the room does not give the client the right to extend his permanence after the established day of departure. In fact, the client is not allowed to use a stove in the room to prepare food or drinks, irons and any other item of electrical equipment or heat-producing equipment except for ordinary bathroom devices. It is forbidden to bring animals to the holiday farm unless otherwise authorised and as long as they do not cause any nuisance to other clients. The animals are not allowed. Cancellation methods may be subject to change in the case of special offers and packages. When making an on-line booking, we kindly ask you, in any case, to check the cancellation policy applied during the different periods.